Ward Goodman’s audit team steamed ahead with fieldwork in preparation for an audit of the Swanage Railway Trust, the volunteer-led charity behind the award-winning Swanage Railway. 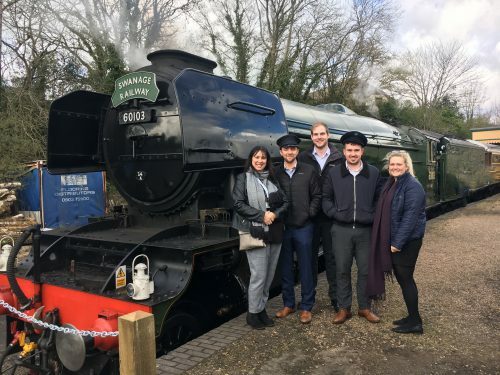 The team, comprising Tom Mackey, Joseph Foard, Dan Cotter and Emily Mitchell, joined Lorna Lock, finance manager at Swanage Railway, as the Flying Scotsman steamed into the town. The record-breaking locomotive was travelling between Norden and Swanage for a week and arrived on the Swanage Railway to be reunited with a rare Devon Belle Pullman observation carriage for the first time in five decades. Ward Goodman, which has offices at Ferndown, Shaftesbury and Wareham, is renowned for its charity expertise.